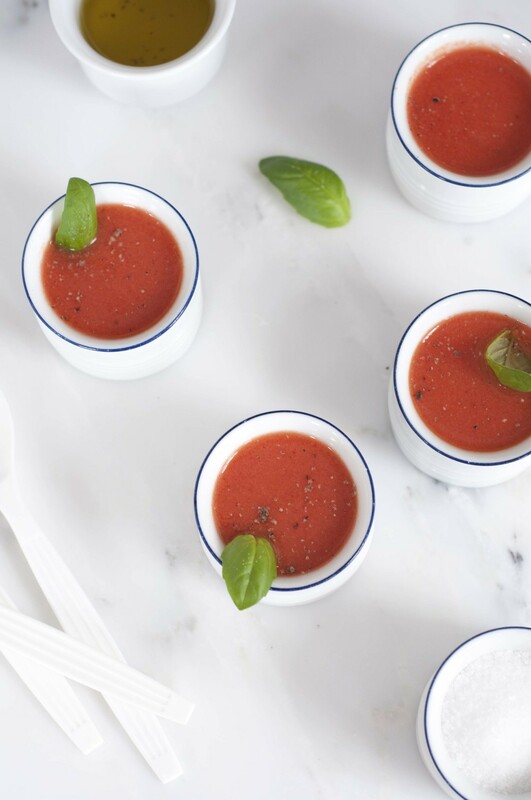 An easy, fresh and healthy summer gazpacho recipe full of tomato, cucumber and watermelon goodness, and why your friends are going to be impressed. A unique recipe brought to you by french foodpreneur Virginie. And I'm in Los Angeles. Can you believe it ? One of my wildest dream was to live in California. And now I'm here. I'm in Cali. I love, love, love the californian lifestyle, and I have the feeling that I'm back home. Spending the summer between family in Alsace, France and my new home in California gave me plenty of time to think about my future business. And I've prepared some exciting things for you in the coming weeks. The first new event is the Live Questions & Answers I will be holding on Periscope. Periscope is a LIVE online streaming App. Download the App on your phone, sign in and connect to @elleetgourmande. Be ready to write your questions related to this recipe. I'm going to answer your questions live ! I'm sooo excited. The first live Q&A will be held Monday, September at 28th at 1pm PDT, 10 pm CEST. Check the Time Zone Converter for your city. But first, let's talk Gazpacho recipe, baby ! Gazpacho is the perfect summer recipe and here's why you should give it a try. Now you'll have more time to watch the last episode of Scandal. Look at all those beauties, delivering good vitamins and minerals straight to your body. If you're thinking to eat more raw veggies, but don't know how to begin, this recipe is for you. I love this one. The base ingredients are tomatoes, vibrant red and almost over riped tomato, with full of aromas. The ratio to keep in mind is 2/3 tomatoes and 1/3 of other veggies or fruits. Cucumber adds a little bit more freshness, watermelon adds this delicate and elegant fruitiness/sweetness. This is the sexiest part because Gazpachos are very low in fat. Unless you add the whole bottle of olive oil. Remember that olive oil is mandatory. It helps emulsify the blend, gives some smooth texture and enhances the fragrances. From 1 hour to 1 day before, prepare the gazpacho before your friends arrive, so you won't look like a desperate housewive running like a chick in the kitchen. And the flavours will have plenty of time to thrive. You want to eat it right away ? That's fine too, because the tomatoes have already marinated in the garlic-y olive oil. In this video, I'll show you how to easily cut small slices of a big watermelon without having to run to the Emergency room! Prep all the ingredients as mentioned in the list above. Did you know that winemakers press the grapes very slowly to obtain a grape juice without bad smell ? That's why I would recommend to start blending the gazpacho slowly and increase progressively until high speed. Don't add any kind of onions, they don't like to be mixed and you'll have a strong modified onion flavour. Add some roasted pine nuts for crispiness.